Growing up makeup was never my forte. I didn't start wearing it until my sophmore year of high school and even then very minimally. Since starting my blog I've grown to love makeup not as a way to hide imperfections, but to have fun--the same way I do with clothing. 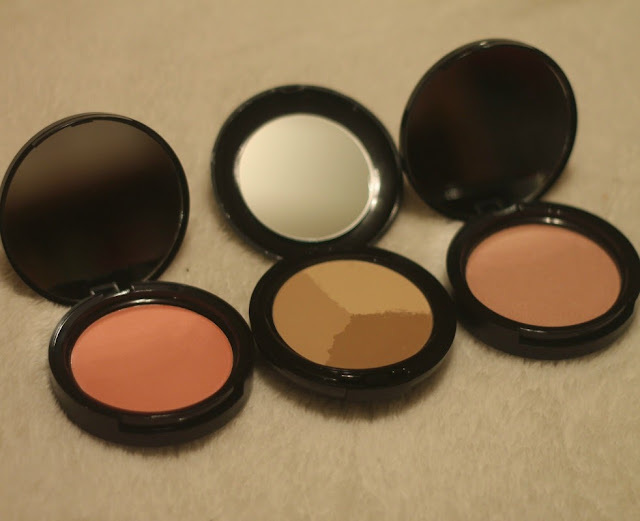 In the past year or so I've started getting into more 'higher end' brands like MAC and Benefit and it's been interesting to test the quality difference from drugstore brands. 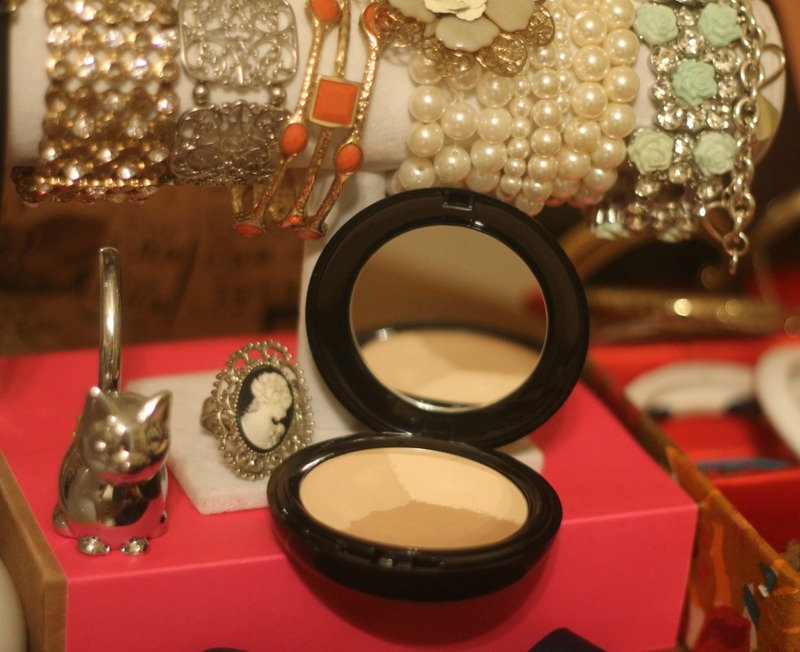 In my town there is a local boutique called Posh and the owner, Laura, has her own cosmetics line. 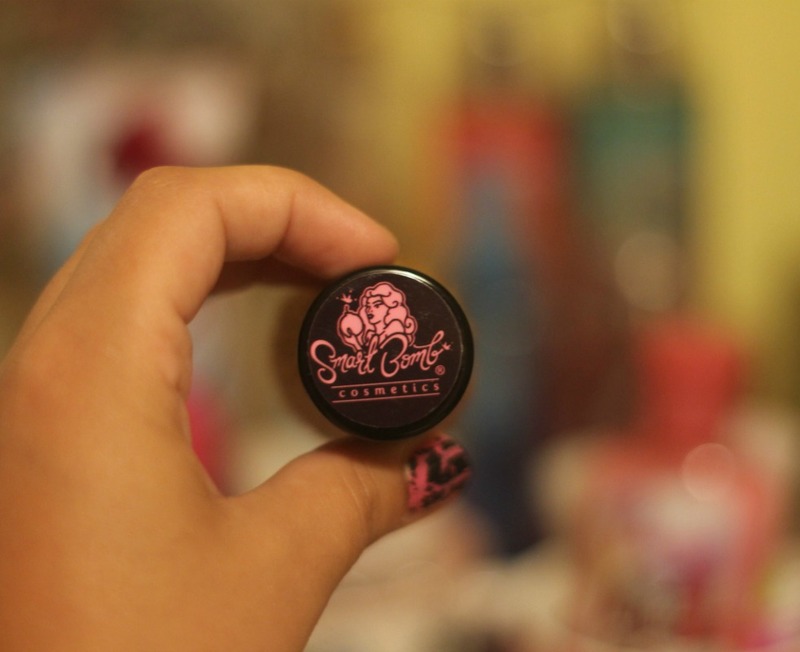 Not like she simply carries it in her store, but that she has come up with all of the formulations, colors, packaging, names. Everything. 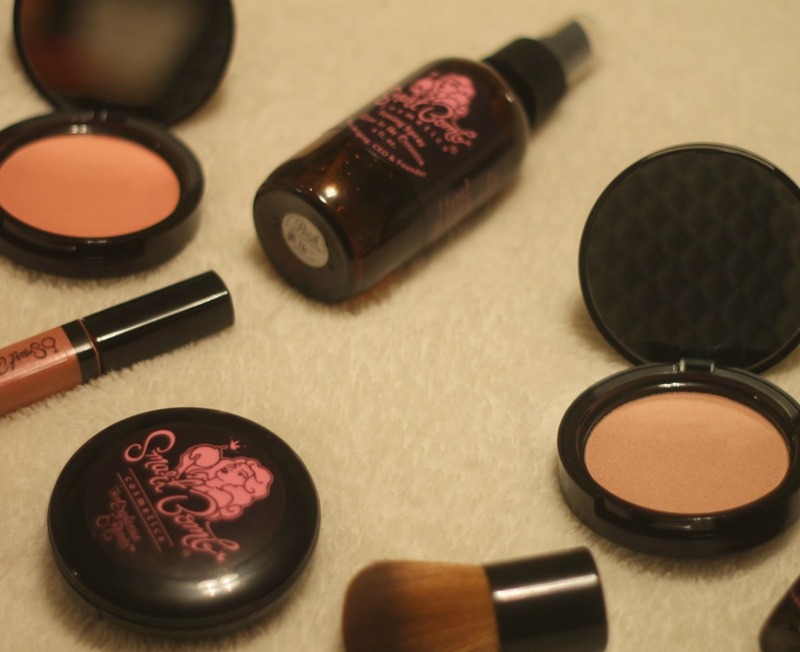 I was over the moon excited when she contacted me to possibly do a review on some of her (incredibly extensive) line of all natural cosmetics called Smart Bomb. I am so excited to help out local businesses in my home town and I know truly how much hard work goes into starting a business from the ground up after studying about it in school. 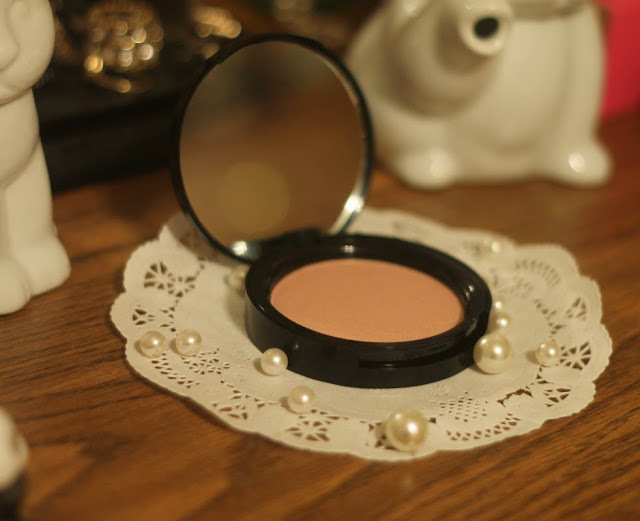 I've been searching for the perfect pinky blush for years and was going to purchase one from MAC before I tried this out. 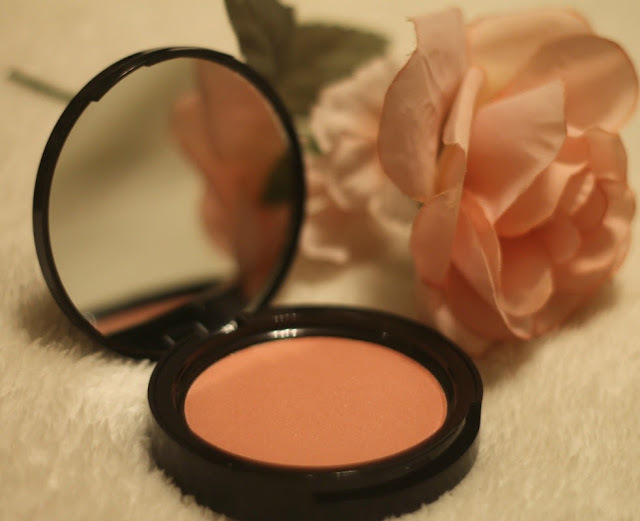 This Smart Bomb blush was very soft to the touch since it has jojaba oil in it, as well as, anti-aging ingredients (which I don't need quite yet but it's never too late to start!). I found it to be thee perfect pink I'm looking for where it gives that glowing affect on the cheeks and is very subtle but pretty. 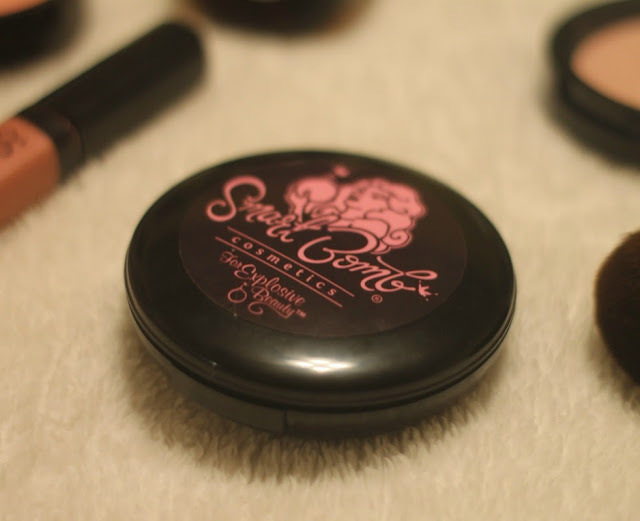 It came in an easy and convenient compact with a mirror great for touch ups! Rose to the Occasion Toning Spray. About mid way through last year I began getting into watching beauty videos on YouTube and I always saw them talk that using a toning spray was essential. A toning spray basically is used to set your makeup after you put it on and to use as a refresher throughout the day. I wish I could get this toning spray in a perfume because it smelt that good--if you like roses this is for you. It felt very cool and refreshing when sprayed on and dried to a matte finish. I found it did help my makeup stay on better throughout the day, but I did have to use this once or twice again in the day to reset. You all know I love me some lipstick! It is my favorite cosmetic to use, so I was incredibly excited to try this out! There are 17 different colos of 'sweet talk' lipsticks Smart Bomb carries and I was given Posh to try out--a soft, muted pink. The packaging was very sleek and secure unlike Limecrime tubes I've had in the past where they cracked and felt very flimsy. All of them are a matte formula but I honestly wouldn't even notice because it felt very creamy going on. I am a sucker for MAC lipsticks and my favorite formula of theirs is matte, but it does tend to be drying. This was not, however, in the least bit which I found surprising! The color was flattering for a blue toned pink which tend to not look good on me. 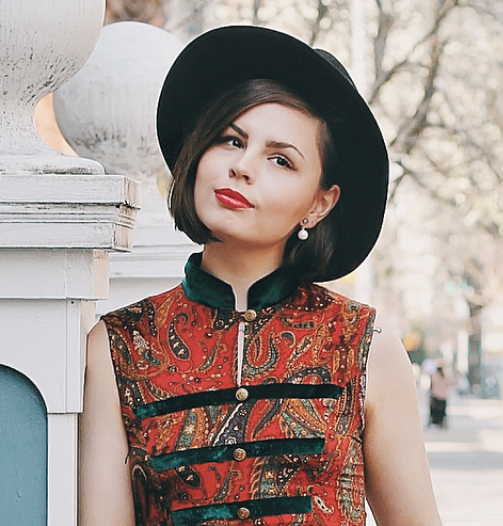 I wore it in this outfit post! Ah! I love the name of the Smart Bomb lip glosses. 'You're such a smart mouth' cracks me up :) I am not a lipgloss person at all. I don't own one so I was weary to try this, but Laura insisted it wasn't like normal lip glosses. I don't like sticky, I don't like overly obvious shiny lips, but this formula is actually a lip gloss/lipstick formulation. 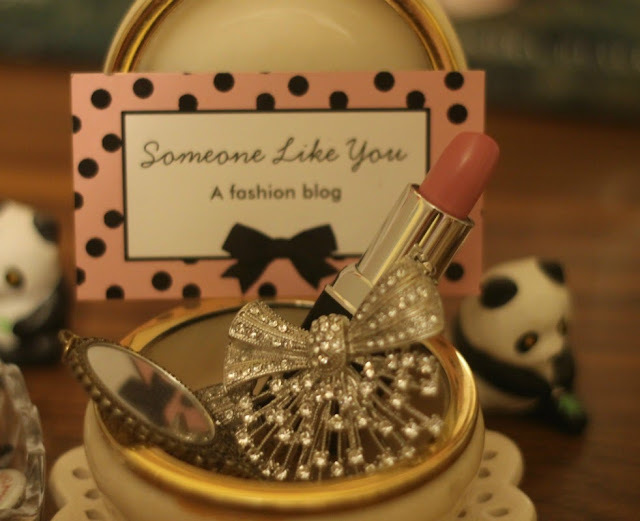 It's in the form of a lip gloss and applies like one, but I found it to have great staying power like a lipstick. I know this sounds weird (like, really weird), but it tastes so good I love having it on my lips. That's a big problem I have with lip products in general is the crayon like taste they tend to have. 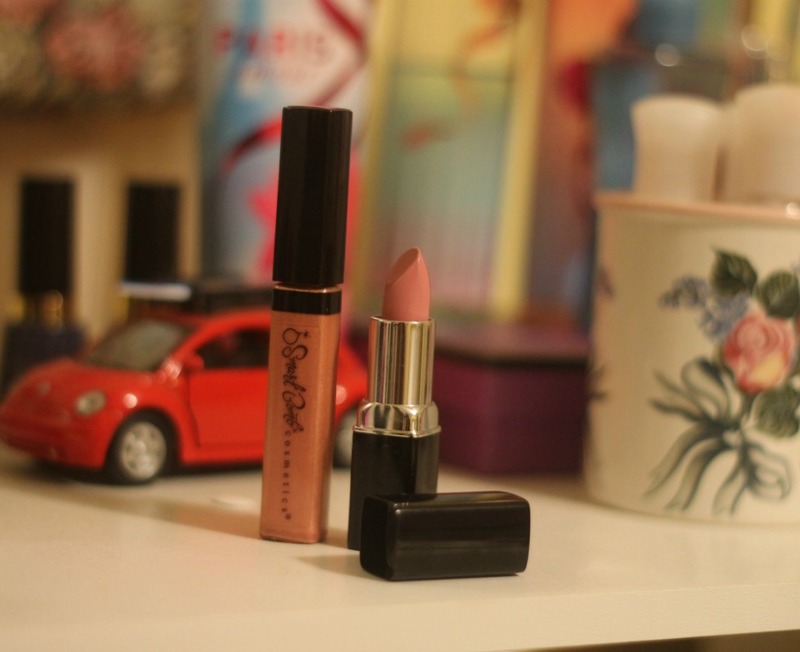 Couldn't find a trace of it in this nudey pink lip gloss. I have a feeling when I have a boyfriend someday he'll love this stuff as much as me! Like the toning spray I have never tried a high lighter either. This one had pretty flecks of gold shimmer in it and I liked that it wasn't completely white like most high lighters I've seen. Instead it was a warm, sunnier color. Laura told me to put it under my eyes to look more awake and at the top of my cheekbones to accentuate them. I found it definitely brightened up my face upon using, but I don't think my cheek bones are defined enough in general to notice the difference on top of them. Baby face forever! This product is from God himself. Seriously. Laura created the whole formulation for this skin care product herself (actually all of them) and it is so impressive. A little bottle, what could it do, right? This stuff is a miricale worker. 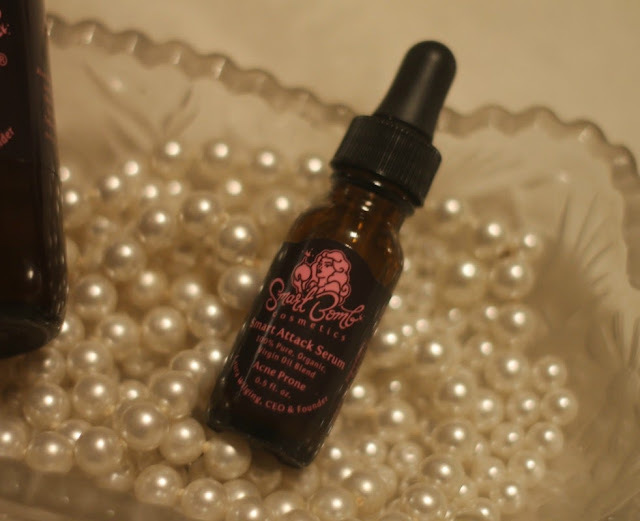 The Smart Attack Serum is an acne spot treatment that works wonders. I literally dab a little bit of this oil on any problem pimple I'm having and I kid you not, it is significantly reduced or GONE by morning. Incredible. I've tried lots of acne spot treatments before and this is the only one that has truly worked. Since having tried it, I don't think I'll ever go without and plan on purchasing for the rest of my life. I will never live without this miricale bottle! If you have any trouble with acne or just an occasional break out-- please give this a shot. You will not be disappointed! After the Smart Attack Serum this is probably my second favorite product. When Laura tried it on me in the store I was blown away by how beautiful this mineralized pressed power foundation made my skin look. I don't have GREAT skin. It's pretty average to slightly below average. I don't have terrible acne but I do get occasional pimples along with my skin being very uneven in tone, lots of pores, and definite scarring from when I used to pick as a pre-teen. This powder took all of that away and created a beautiful, air brushed look. Now that's what foundation is supposed to do! I know when bloggers do reviews it can be hard as a reader to know if they are being honest or not because the products were gifted to them; but, I am truly blown away by this company. Laura has been working on her cosmetic line for 10+ years and been involved with makeup for even a decade more. I've found these products to be very satisfying along with beautifully presented and decadently smelling, tasting, feeling. I am just so in love with all this company stands for-- independently owned, retro, feminine, organic, and has a real, inspiring story behind it. 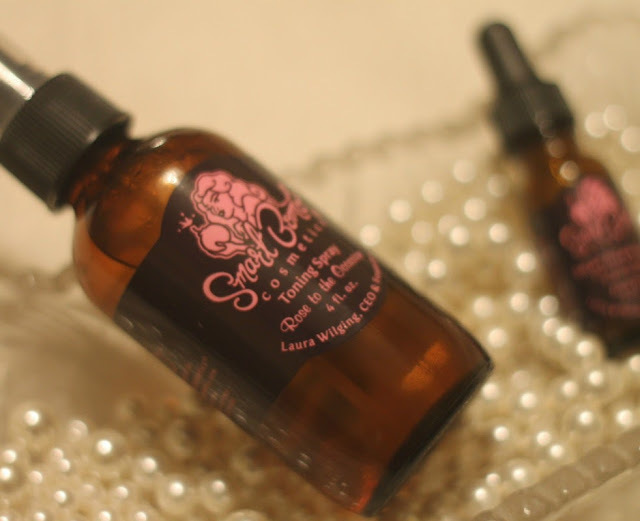 Smart Bomb has many other products to look into like skin care, eye shadows, and even a perfume scent that Laura created herself. Here is the Smart Bomb Website//Instagram//Facebook if you are interested! Lengthy ago i discovered your blog and still have been Best Garcinia Cambogia reading along. When i imagined I'd personally keep our primary opinion. When i are not aware of things know about point out apart from that we get relished reading. Pleasant weblog. I'll keep visiting this blog often.